Lab Assistant, Photographer, Inspector, Assistant Teacher, Enforcement Officer, Supervisor, Junior Assistant etc. UKSSSC will fill up total 1546 Jobs through Online mode, so interested and eligible candidates may visit Official Website of UKSSSC i.e. http://www.sssc.uk.gov.in/ and apply Online from 22nd January, 2017 to 12th March, 2017. UKSSSC will conduct an Objective type written test to select candidates for Supervisor and other Vacancies. 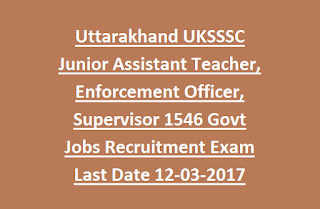 All details of Uttarakhand UKSSSC Junior Assistant Teacher, Enforcement Officer, Supervisor 1546 Jobs mentioned below. 1. Starting date for UKSSSC Online submission of Application forms is 22nd January, 2017. 2. Closing date for UKSSSC Online submission of Application forms is 12th March, 2017 by 11.59 PM. 3. Closing date to deposit Application Fee is 14th March, 2017. 4. Issue of UKSSSC Admit Card will be notified soon. 5. Tentative UKSSSC Written Exam date will be updated soon. 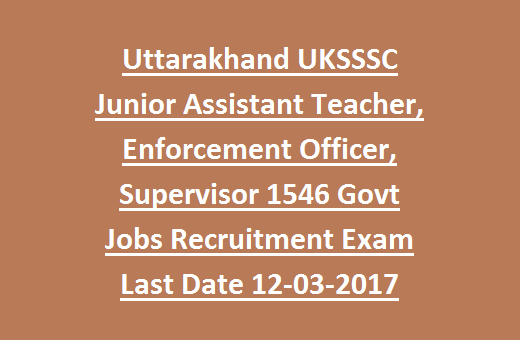 UKSSSC (Uttarakhand Subordinate Service Selection Commission), Dehradun has released total 1546 Jobs of Junior Assistant, Assistant Teacher, Enforcement Officer, Supervisor etc. Educational Qualification for candidates must be Intermediate or its equivalent Qualification from a recognized university with required typing skills for Supervisor and remaining Jobs. Please refer to UKSSSC Official Notification for more details. Age Limit must in between 21 years to 42 years for Lab Assistant, Photographer, Inspector, Overseer/ Exhibitor, UKSSSC Co-Supervisor, UKSSSC Stenographer Grade 2, UKSSSC Assistant Writer Jobs; Age Limit must in between 18 years to 42 years for UKSSSC Classification Supervisor and remaining Jobs. 1. Rs.9300/- to Rs.34800/- per month with Grade Pay of Rs.4600/- or Rs.4200/- for UKSSSC Personal Assistant, UKSSSC Dental Hygienist Jobs. 2. Rs.5200/- to Rs.20,200/- per month for UKSSSC Supervisor and remaining Jobs. UKSSSC (Uttarakhand Subordinate Service Selection Commission), Dehradun will conduct an Objective type written test to select candidates for UKSSSC Supervisor and other Vacancies. Rs.300/- for General, OBC category candidates of Uttarakhand; Rs.150/- for SC, ST, Ex Serviceman, Physically Handicapped candidates of Uttarakhand. Pay UKSSSC Application fee for Supervisor and other Jobs through Online mode using credit card or debit card or net banking system. Interested and eligible candidates may visit Official Website of UKSSSC i.e. http://www.sssc.uk.gov.in/ and apply Online for UKSSSC Supervisor and other Jobs from the date of 22nd January, 2017 to 12th March, 2017.